Shopping for a new Chevrolet Silverado 1500? The 2019 Chevrolet Silverado gets a new design this year, and drops up to 450 pounds in the process, but it’s more focused on its mission than ever. Its bed is bigger and offers more features, and its cab gets bigger, making this brawny pickup better at hauling cargo and people. Chevrolet also improves road manners, adds safety features, and adds more models to serve more buyers. The Silverado expands from six to eight trim levels this year. The Silverado is offered in Work Truck, Custom, Custom Trail Boss, LT, LT Trail Boss, RST, LTZ, and High Country trims, with plenty of options on the docket. The powertrain lineup also expands for 2019. The 4.3-liter V-6, 5.3-liter V-8, and 6.2-liter V-8 return. The 5.3 now comes in two versions: one with a 6-speed automatic and Active Fuel Management that shuts down four cylinders under light load conditions and a new version with an 8-speed auto and GM’s new Dynamic Fuel Management (DFM) system that can shut down one to six cylinders. The 6.2-liter V-8 gets DFM and a 10-speed automatic. A 2.7-liter turbo-4 engine gets the 8-speed, and a 3.0-liter turbodiesel inline-6 comes with the 10-speed. City fuel economy for the V-8 engines increases by up to 5 percent thanks to the new DFM system and a diet that cuts up to 450 pounds, but in most trims, the new Silverados are less efficient than the trucks they replace, and rank lower in towing and payload than their prime rivals. A new frame and body, both made lighter by GM’s mixed materials strategy, contribute to a smoother ride and improved dynamics. Though larger than before, the Silverado offers controlled handling, direct steering, and a smooth ride, but it is still subject to some bounding motions, especially with an empty bed. That bed is larger for 2019. It’s an inch taller and an inch longer and almost 7 inches wider on the inside. That gives it 20 percent more cargo capacity. Chevy offers 5-foot-8, 6-foot-6, and 8-foot bed lengths. Chevy also offers rear- or four-wheel drive with low-range gearing, as well as regular cab, double cab, and Crew Cab body styles. The Crew Cab adds 2.9 inches of rear leg room. The various trim levels offer a truck for every need. The Work Truck has vinyl flooring and vinyl or cloth seats, but it also comes with a 7.0-inch touchscreen infotainment system with Apple CarPlay and Android Auto compatibility. The three Trail Boss models get the Z71 package, which includes a 2-inch lift, Rancho shocks, a locking rear differential, skid plates, and 18-inch off-road tires. The High Country is loaded with full LED lighting, an 8.0-inch version of the infotainment system with navigation, remote starting, leather upholstery, heated and cooled front seats, heated rear seats, a heated steering wheel, and a power up/down tailgate. In addition to the low-speed automatic emergency braking and active lane control that the Silverado offered last year, the 2019 model adds blind-spot monitors, rear cross traffic alerts, a surround-view camera system with multiple trailer views, and a rearview camera mirror. It has not yet been crash tested. A square-jawed grille dominates the 2019 Chevy Silverado’s look on the outside, but inside it’s all business with smartly placed controls. The Silverado grows longer this year by 1.7 inches, wider by 1.2 inches, and taller by 1.5 inches, while its wheelbase gets 3.9 inches longer. All Silverados feature upright styling with a blocky front end dominated by a massive grille. The headlights sit at the top as small slits, and the body sides extend into the front end below them. The trim level determines the look of the truck. Work Truck models have black trim, while mid-line models add body color trim, and higher-line trims get plenty of chrome. The black grille can look like a large Darth Vader mask, and the overly chrome grilles are also distracting. The mix of body color and chrome is best. Along the sides, the fenders bulge noticeably front and rear, and the square-cut wheel cutouts have given way to rounded ones. The integrated steps in the rear bumper get bigger this year to accommodate work boots. Inside, the look is simple, orderly, and business-like. The center stack features 7.0- or 8.0-inch touchscreens. All of the controls are large and well placed, and the power outlets are located at the base of the center stack where they are easy to access. 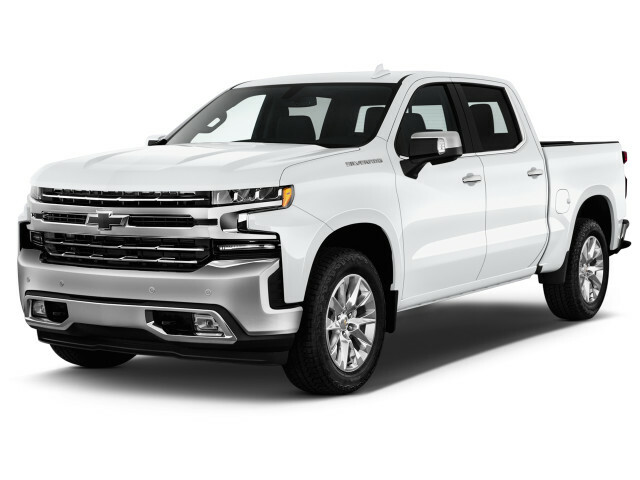 Smooth-riding, well-controlled, and powerful with either V-8, the 2019 Chevrolet Silverado is pleasant to drive while it gets work done. The 2019 Silverado engine lineup starts with the 4.3-liter V-6. We haven’t driven it yet, but we did last year. Rated at 285 horsepower and 305 pound-feet of torque, it provided adequate power in the 2018 model and with the 2019’s weight loss, it should be more livable, with a new 10-speed automatic. The V-6 gets the tried-and-true, but aging, 6-speed auto. Also new is a 3.0-liter turbodiesel inline-6. It, too, comes with the 10-speed. We haven't driven these two versions yet. Two versions of GM’s 5.3-liter V-8 are offered. The base version is paired with the 6-speed and comes with Active Fuel Management that can shut down four cylinders under light load conditions. The other gets an 8-speed automatic and the new Dynamic Fuel Management system that can shut down one to six cylinders. Both are rated at 355 hp and 383 lb-ft of torque. The top dog is a 6.2-liter V-8 that churns out 420 horses and 460 lb-ft of torque and sends that power through the 10-speed automatic. Both V-8s are strong, though they don’t provide the immediate grunt of Ford’s twin-turbocharged 3.5-liter V-6. The 6.2-liter is noticeably more willing. Both engines deliver smooth acceleration, as well as a pleasing American rumble. All three automatic transmissions provide smooth and willing shifts with the V-8s, but we haven’t tested them with the new turbo-4 or turbodiesel. The Silverado pulls a load well, too. The 5.3-liter V-8 maxes out at 12,200 pounds with four-wheel drive. An integrated trailer brake controller, a new towing checklist in the instrument panel, and a new towing app make the towing experience that much easier and worry-free. One four-wheel-drive system is offered; it’s the advanced version from last year. It includes a two-speed transfer case and has an automatic mode that can be used on any road surface. Changes to the suspension for 2019 only serve to make a smooth ride smoother, while the weight loss helps improve control. The Silverado is exceedingly comfortable on the road, and its steering is nicely weighted and direct. While it leans like any tall vehicle would, the truck responds well to driver inputs, even the taller Trail Boss models. Passengers will also notice that cabin noise is kept to a minimum, again even in the Trail Boss models with their knobby tires. A versatile bed and a smartly designed interior make the 2019 Chevy Silverado a workhorse. The 2019 Chevrolet Silverado’s cabin is smartly laid out and the Crew Cab is especially spacious, but it’s not luxurious. The bed is deep and versatile, which is a big plus for a truck. Inside, the Silverado doesn’t push into luxury like its rival the Ram 1500. Even though Chevrolet provides soft-touch surfaces where they matter, like on the dash, center console, and door tops, the quality of some of those controls is lacking. However, the cabin layout works well for those who need to get stuff done. Its deep center console is sized to fit file folders or a laptop computer, the large switchgear is ready for gloved hands, and the power outlets are placed right at the base of the center stack where they are easy to find and access. Chevy improves what was already a spacious Crew Cab cabin this year, adding 2.9 inches of rear leg room. The front seats are roomy and comfortable, and the truck has enough width to fit three across in the second row. Chevy also adds interior storage space with fold up rear seat bottoms and storage pockets in the rear seatbacks. The bed, which is offered in 5-foot-8, 6-foot-6, and 8-foot lengths, adds 20 percent more cargo volume, mostly by gaining almost 7 inches of width between the bed sides. For versatility, Chevy mounts 12 fixed tie-downs, each of which can withstand 500 pounds of force before bending, and includes nine moveable tie-downs. The aluminum tailgate is offered with lift assist, a power lock, and a power up/down feature. All of these features, plus the bed steps and spray-in bedliner, make the Silverado’s bed among the most versatile on the market. More safety features are available for 2019, but the best are reserved for high-end models and the new Silverado has yet to be crash tested. Standard safety features include six airbags, trailer sway control, hill start assist, and a rearview camera. Standard on the High Country and optional for LT and above is the Safety package with front and rear parking sensors, blind-spot monitors, and rear cross-traffic alerts. Offered only for LTZ and High Country is Safety Package II with forward-collision warnings with automatic emergency braking, lane departure warning with active lane control, automatic high beams, and GM’s Safety Alert Seat that vibrates in the direction of potential hazards. We feel that Chevrolet should offer this package on more than just the high-end models. As a new vehicle, the Silverado has not been crash tested by either agency that conducts such tests. We will update our scores once it is tested. With a variety of models, engines, and body styles, there’s a 2019 Chevy Silverado for most every truck buyer. The model lineup consists of Work Truck, Custom, Custom Trail Boss, LT, LT Trail Boss, RST, LTZ, and High Country. The Work Truck trim is made for contractors. It comes with vinyl flooring, vinyl or cloth seats, a 7.0-inch touchscreen infotainment system with Apple CarPlay and Android Auto compatibility, and 17-inch steel wheels. The Custom gets LED taillights and 20-inch alloy wheels. The Custom Trail Boss comes standard with the Z71 package, which includes a 2-inch lift, Rancho shocks, a locking rear differential, skid plates, and 18-inch off-road tires. LT models add LED headlights and daytime running lights and an 8.0-inch version of the infotainment system. The RST gets full LED lighting, including the fog lights, remote starting, keyless access and starting, wheel sizes up to 22 inches, and a tough street look. Our choice would be the LT or its mid-range siblings the LT Trail Boss for those who like the off-roading equipment or the RST for the sleeker street look. The larger infotainment is useful, the LED lighting provides better illumination, and pricing shouldn’t shoot too high, though many features won’t be offered, including the safety equipment. LTZ buyers get power folding and heated outside mirrors, and leather upholstery, while High Country customers receive navigation, heated and cooled front seats, heated rear seats, a heated steering wheel, and a power up/down tailgate. The Z71 package is offered on all models, as is a four-wheel-drive system with low-range gearing. Other options include a spray-on bedliner, a Max Trailering package, and an Advanced Trailering package with an in-vehicle trailering app and multiple camera views to help with towing. The Silverado’s V-8s have historically provided good real-world fuel economy, and they are better this year. Even more efficient 4-cylinder and diesel options are coming. The Silverado’s V-8 engines are relatively efficient, and new turbo-4 and turbodiesel inline-6 engines this year will be more efficient choices. The most common version is the 5.3-liter V-8 mated to the 8-speed automatic in a rear-drive Silverado. According to the EPA, it is rated at 17 mpg city, 23 highway, 19 combined. Similarly equipped, that beats a 2019 Ram 1500 by 2 mpg across the board. With four-wheel drive, the Chevy’s numbers drop to 16/22/18 mpg, and in the Trail Boss they fall further to 15/20/17 mpg. The 5.3 with the 6-speed and rear-drive is rated at 15/22/17, while the 4WD version gets a 15/21/17 rating. The most efficient Silverado carries a new 2.7-liter turbo-4 engine. The EPA scores it at 20/23/21 mpg with rear-wheel drive, and 19/22/20 mpg with four-wheel drive. V-6 Silverados check in at 16/21/17 mpg in 2WD form or 15/20/17 mpg with 4WD, slightly lower in Trail Boss editions. With the 6.2-liter V-8, the Silverado is rated at 16/20/17 mpg. It comes only with 4WD and a 10-speed automatic. In our experience, real-world fuel economy should meet or beat those numbers for all V-8 models. The 6.2- and 5.3-liter with the 8-speed get GM’s new Dynamic Fuel Management system. It can shut down one to six cylinders when full power isn’t needed. GM shuts down cylinders in 17 “fractions,” going beyond six by shutting down cylinders on different turns through the firing order. Expect the 4.3-liter V-6 to get 20-21 mpg combined, and the turbo-4 and diesel to be even more efficient.